The Ribbon Girl, Tildas Town, Stamp and Create. I have used one of my all time favorite Butterfly tilda from Butterfly wishes collection.Colored her with distress markers and inks.Card shape is made using Go-kreate dies.Hope you all like it.Now hop on over to Marvelous magnolia challenge blog for more stunning creations from our DT memebers and to play along. Lovely hAnglar or Sweet Magnolia - Love or Hearts. 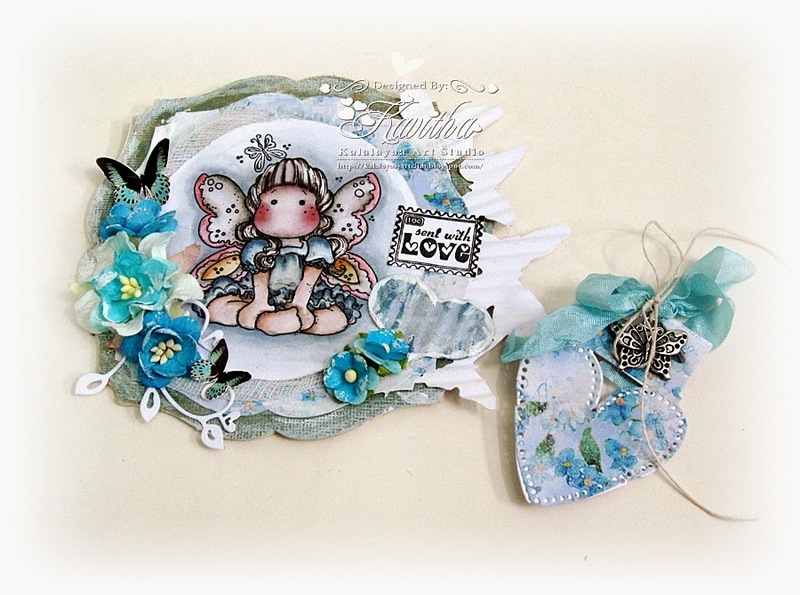 Gorgeous card Kavitha - Tilda is coloured wonderfully and I love the beautiful details! Lovely card. Pretty colours and image. Thanks for playing along at ABC Challenges. What a lovely shaped card, very pretty colours & lo. This is so cute!! Love the shape! Your coloring is beautiful! Love the flowers too.. Just stunning!! Thanks so much for playing along with us at Open-Minded Crafting Fun Challenges!!! Good Luck! I hope we see you again!! What a beautiful card!Thanks for joining us at TFMC. Stunning shape card, stunning details and amazing and gorgeous coloring of your image! Thank you for sharing your amazing creation with us at Creative Knockouts No Square Cards Challenge. wow this is soooo pretty! Love all the great embellishments you have added. Great details and love how you have colored Tilda! What a lovely card you made, I love these blue colours and lovely details. Thank you very must for joining us at the DML and hope to see you next time. Fabulous Creation and so pretty.